The Department of State Service on Thursday thumped its chest following the arrest and recovery of a large cache of arms and ammunition from kidnap kingpins, who had been terrorising parts of Kaduna, Katsina and other parts of Nigeria in recent times. 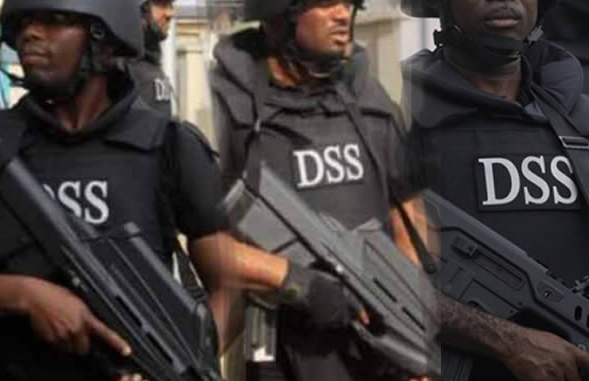 A statement made available by the DSS to Vanguard and signed by its Spokesman, Peter Afunanya, said the arrest of the suspects followed its collaboration with the military to comb the hideouts of the malevolent elements. Afunaya said that the raid followed on the heels of the dastardly abduction and killing of the traditional ruler of Adara Chiefdom, HRH Maiwada GALADIMA in Kaduna State by the hoodlums. “Relative peace has since returned to Kaduna State after the disturbances that followed his violent abduction and gruesome murder of the traditional ruler in Kaduna State. “It is to be noted that concerted efforts are being made to address the resurgence of organized criminal activities in the North-West,” Afunanya said. “On 25th October, 2018, in Riga Chikun, Kaduna State, five members of a dreaded kidnap gang whose operations span between Kaduna and Katsina States were apprehended. They are: Isa AHMADU (Gang Leader), Suleiman UMAR (Ransom negotiator), Ibrahim MALLAM, Ishaku SAIDU (aka ISHE) and MANSUR (Mallam). “After a preliminary investigation, the group’s hideout in Katsina State was raided. This led to the arrest of two other members of the group namely: Muhammadu IBRAHIM and Muhammed ISA. Earlier on 19th October, 2018 Sirajo IBRAHIM, a suspected infamous kidnapper was arrested at Hayin Danmni, Igabi LGA of the State. “On 30th October, 2018, at Sainyinan Dani, Yabo LGA, Sokoto State, the duo of Abubakar UMAR and Suleiman SANI were arrested for gun running. Between 11th and 12th October, 2018, suspected armed bandits operating in and around Zamfara State were also arrested in Bakura, Tsafe and Bungudu LGAs of the State. Those arrested were Dan-Alhaji DAN-MINERI, Yusuf KHALIF and MUSA (Mallam). “On 5th November, 2018, the tactical team of the Service, in collaboration with the military, arrested Muhammed AMINU, a suspected gunrunner and his accomplice, Dare OKUNWOLA (aka BODA) at Lere LGA and Agindi, Jos in Kaduna and Plateau States respectively. During a search of OKUNWOLA’s residence, several ammunitions and eight AK-47 rifles were recovered. “On the same date, in Toungo LGA, Adamawa State, Abbas ABUBAKAR (aka SAMBO) a suspected Improvised Explosives Device (IED) expert for the Islamic State in West Africa (ISWA) was apprehended. “Also on the same date, at Ikot Akpan Idem, Ukanafun LGA, Akwa Ibom State, Otu EKONG, a serial kidnapper was arrested. At the start of October, the trio of Abdulhamid ISA, Adamu ADAGIRI and Nuhu AHMED, who are members of a kidnap gang that operates between Kogi and Edo states, were arrested in the state. “Investigations have so far uncovered leads that will enable the Service and other sister agencies to address the menace of kidnapping in the country. Suspects will undoubtedly be prosecuted in accordance with the law. “The DSS reassures the public that the tempo of these operations will not only be sustained, but strengthened for greater impact on the well being of residents.